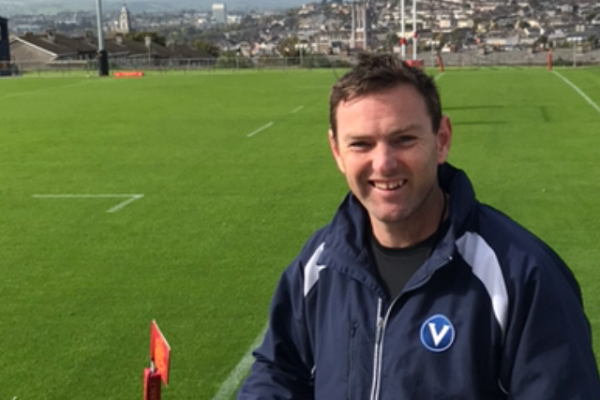 A man with extensive VAFA and VFL playing and coaching experience, Luke Mahoney, has been appointed to Fitzroy’s senior coaching position for 2018.Luke joins Fitzroy directly from the senior coaching role with Brunswick NOBSPC and is currently in Ireland as the Assistant Coach on the 2017 VAFA Ireland representative tour. Speaking from Ireland after accepting the role, Luke said “I’m really excited to be offered the senior coaching position at Fitzroy. Having watched from afar, I have always had an enormous amount of respect for the club and its community aspect and history. 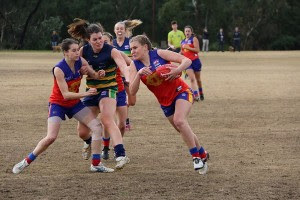 “The main attraction to the club was the continued growth at both the men’s and women’s participation levels in the VAFA along with the huge numbers at the junior club. Fitzroy President Joan Eddy welcomed Luke’s appointment saying his strong understanding of the ethos of amateur football and his collaborative approach to bringing the whole club together were strengths that would benefit Fitzroy. Luke played 290 games with North Old Boys, Williamstown in VFL and St Kevin’s Old Boys (SKOB), including as captain and premiership captain for SKOB in 2004 and several VAFA rep games. He won four best and fairest awards with the club. At SKOB Luke had a number of coaching roles including Coaching Director in 2015 (an undefeated year when SKOB was promoted to Premier), Senior Assistant Coach (under Daniel Harford) in 2012-13, VAFA Premier B-D4 rep Assistant Coach 2014, Senior Coach with Brunswick NOBSPC in 2016 and 2017, winning VAFA Coach of the Year in Division 1 in his first year with the club. Luke’s coaching career started as a playing assistant with SKOB and includes coaching his daughter’s Under 12 team at Moonee Valley. The selection panel of Football Operations Director, Sharon Torney, Treasurer (and former Reds premiership captain) Michael Smale and recently retired Fitzroy senior player and vice-captain, Corbin Stevic, were thrilled with the calibre of a large pool of candidates but unanimously selected Luke as their first choice. Elite was the word used to describe backman Max Ellis’s season as he was awarded the Greg Roughsedge Perpetual Trophy as Fitzroy’s Best and Fairest player for 2017 on Friday night. But ask his team mates and his former coaches, and it’s not the only compliment likely to come his way; coachable, respected, committed, determined and most of all, never beaten. “It's really good playing with someone like Max because you know he is going to give 100 per cent each week and he never gives up, and he makes those playing alongside him better,” said Captain Rory Angiolella. “I think Max is a really deserving winner of the Greg Roughsedge trophy. His consistency on the football field was mirrored through his dedication to training. He barely missed a training session from the moment he came back in preseason. Although he is a quiet person around the club, he is super competitive and takes being beaten on the field really personally, which is why week in week out he was getting the better of the most dangerous forward for the opposition. “Max is also a die-hard Fitzroy boy and he really cares about the club. I think that came through in his football this year,” Rory said. Rory’s comments are mirrored by those of Max’s Under 19s coach, Tim Bell. “The thing that I probably remember most about Max is what an absolute pleasure he was to coach, a really quiet and respectful guy. A team player, greatly respected by his peers. “He was so coachable, you would give Max a job to do and he would never let the team down. Pretty much what you see now is what I saw when I coached him. He took on board all advice and played at a hundred percent, week in, week out. Max never played a bad game. He had great anticipation and was a really good mark and kick. “What probably elevated him above a lot of others, was his absolute determination and concentration - never beaten……never. It was an honour to coach him and I feel privileged that I had the chance to do so. “We are lucky to have him at the club,” Tim said. 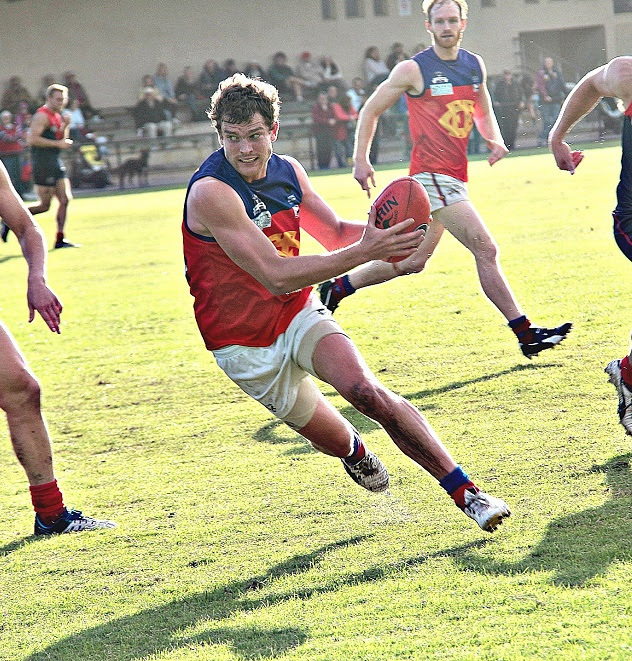 After a year away from football travelling in 2016, Max made his intentions clear in Round 1 against Parkdale, standing out in an exhilarating three point win to Fitzroy. When the team was most under pressure Max was at his best, perhaps demonstrated most clearly by his two best on ground performances in Fitzroy’s final two games this year. The strong, silent type of the backline had a season of great pressure but you never would have known from his cool, calm decision making. In his acceptance speech, Max thanked his team mates, coaches, sponsors and 2017 Senior Coach Nick Mitchell for his commitment, time and effort this season, saying no one could doubt the passion he had for the players and the club. He called for the players to stick together and “go back up”. Like a number of his team mates, Max is a home grown Fitzroy player, starting as a junior coached by his dad and current Fitzroy scoreboard attendant, Mike Ellis. He played with Fitzroy all the way through to Colts and had the benefit of Tim Bell’s coaching at Under 19 level. He has previously collected two coaches awards along the way. 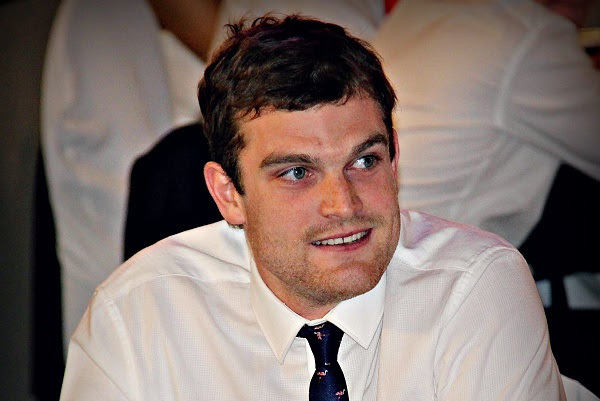 It’s hard to think of someone with better Fitzroy pedigree – Max went to North Fitzroy Primary and Fitzroy High. He is now a teacher at Wheeler’s Hill secondary college. Congratulations Max on an outstanding season. The Bill Atherton Trophy for the best and fairest in our Under 19 (2) – Rhys Dolby. We might be crying because she’s in Argentina, but there was very little surprise when the unstoppable Tash Ross-Harris, who won the inaugural best and fairest for the whole competition, took out the Elaine Findlay Perpetual Trophy for Fitzroy’s Women 1 best and fairest on Friday night. 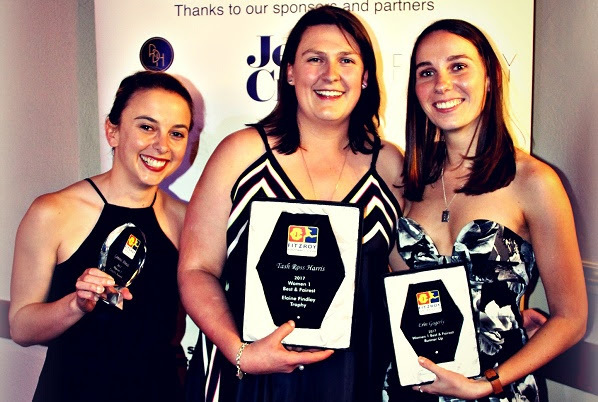 There is not a lot more that can be said about Rosso that wasn’t said when she won the top prize at the Inaugural VAFA William Buck Premier Women’s Best and Fairest, having been awarded best on ground in seven of the first 10 games of the season. For more details on that win and her comments at the time, check out the story on our website. As she is so far away, it was Fitzroy-ACU full forward, Liz Olney, who accepted the award on Tash’s behalf at the Redlow (centre). The runner up was Erin Gogerly (right), who also had a terrific season for Fitzroy-ACU. The Women 1 Coach’s award went to Captain, Gemma Minuz (left), not just for her role on field but also for her work around the club. As if to highlight that point, Gemma had earlier made a speech as captain of the club and encouraged the supporters and players to get around the Women’s 2 team in season 2018 as they often struggled for volunteers during the season just gone. 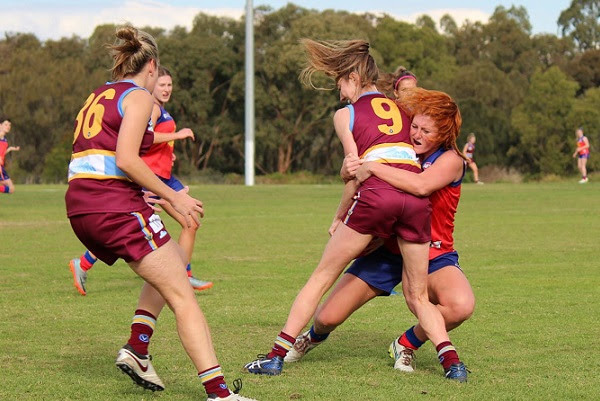 It’s two from two for Fitzroy-ACU Women’s 2 captain Mish Booth, who claimed her second Janet Graham Perpetual Trophy; can’t do better than that. Congrats Mish on another great season. The Runner-up in Women 2 was Rebecca Petrie. The Women 2 Coach’s award went to Frankie Freeman (pictured to the right), who also expanded her own coaching knowledge this year coaching a team with the Fitzroy Junior Club. 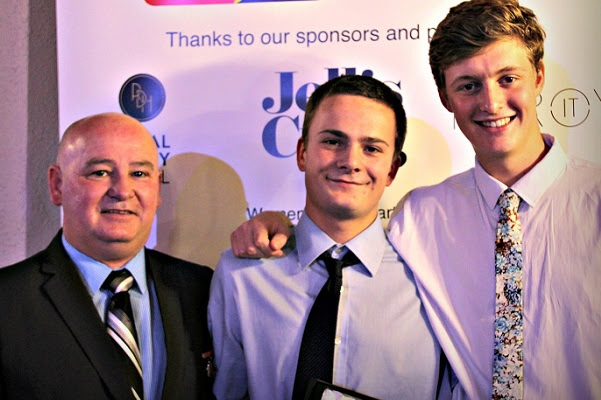 After awarding Oscar Sutcliffe (centre in the image below) the Steve Drury Perpetual Trophy as the best under 19s player at Fitzroy for 2017, Coach Tim Bell described his young charge as determined, dogged and tenacious. “‘It's not the size of the dog in the fight, it's the size of the fight in the dog.’ - that could have been written with Oscar in mind,” Tim said. “We love players that give a second effort, but Oscar gives a second, third, fourth, fifth, or however many it takes to win the ball - he literally won't stop until he has either won the ball, or at least caused a stoppage. Tim said aside from his tenacity, Oscar is also a very skilled player. “He’s a good overhead mark, he took a lot contested marks against bigger opponents. He is also an excellent kick, probably one of the best in the team at weighting his field kicks. Really accurate with a punch kick over 30 metres or so. “Oscar is a good team player, he is one of the blokes you would want with you in the trenches,” Tim said. Oscar played a senior game for Fitzroy this year and Tim hopes he gets some more chances in 2018 alongside the under 19s runner up, Gus Richardson, who is full of senior footy promise according to his departing coach. Looks like the Tim Bell legacy will live on for a while yet! Fitzroy players have passed some major milestones this year and their trophies were presented on Friday night at the Redlow as they were acknowledged in front of their peers. Congratulations also to 150 gamers Ross Borland, Cailean Moore and Jack Atkinson. 50 games – Corbin Stevic, Max Davie, Martin Deasey, Will Zaghis, Isaac Wattis, Lachlan Henderson, Nathan White, Ben McDonald and Olmo Salvatore. And congratulations to the first Fitzroy women's player to go past the 50-game milestone; Alexa Madden. How does the Best & Fairest voting work? For those not familiar with Fitzroy’s voting system for awarding best and fairest votes, this is a brief summary. Following each game, three individuals (usually the coaches, but sometimes other officials) cast their votes. A total of up to 22 votes can be awarded by each of the three voters – so in theory a total vote pool of 66 is possible for any one game. Even though you can award up to 22 votes, you do not have to. No more than 4 votes can be awarded by a voter to any one player. So if a player executes the perfect game, it is possible to score 12 votes – four from each of the three voters. Congratulations to these six stalwarts of our club who have made an incredible contribution to Fitzroy and the Fitzroy Reds. Louise Maniatakis has been named the 2017 Fitzroy Club Person of the Year. Whether it’s getting the prizes ready for the game day lunches, making special gifts for the mums on Mothers’ Day, selling raffle tickets or knitting player beanies, there is no job too big or small for Louise. Her commitment to the club over several years now has been incredible and it’s no wonder she’s our number 1 volunteer for 2017. Thank you so much Louise. In fact, just one more time, thank you to all our incredible volunteers this year – you went above and beyond… click here to read more. With the appointment of Luke Mahoney announced on Friday night, the club has continued its review of coaching positions and there will be other changes and recruitment activity is underway. For the Fitzroy-ACU teams, the good news is that Mick Symons, who coached the Women 1 team to finals in their first season of VAFA Premier Women’s footy, has been reappointed for 2018. 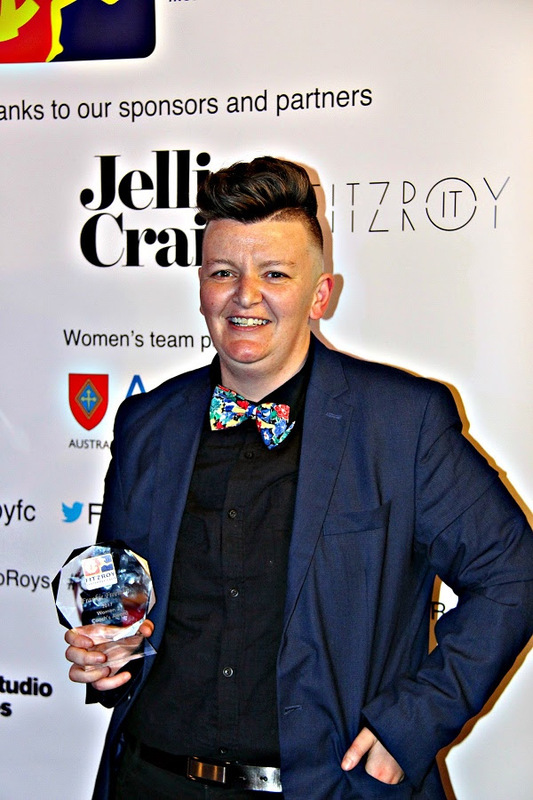 The club will be looking for a new coach of the Women 2 team to replace Jo Hogan. Richard Willingham is stepping down as Reserves coach after 13 years with the club, playing over 150 games, Richard has been a tremendous contributor to the Reds and Fitzroy and the club will be seeking applications for a Reserves coach for 2018. Life member and inaugural coach when Fitzroy Reds entered the VAFA Under 19s competition in 2003, Tim Bell has stepped down as Under 19s coach after an incredibly successful 11 years. The club owes a huge debt of thanks to Tim and you can see the fruit of his labours in the senior side now. Greg Coleman, who coached the Under 19 (2) team this year will be taking the reins for the Under 19 (1) team in 2018. Trent Coleman, who did an outstanding job getting the Thirds to the finals in 2017 has been reappointed Thirds coach for 2018. For those interested in attending the AGM it will be held in the Community Rooms on Sunday 26 November at 2pm. For confirmation of details, please keep an eye on the Fitzroy website. The club would like to extend a massive thank you to all members, players, parents and supporters who attended the Redlow at the Regal Ballroom on Friday night. 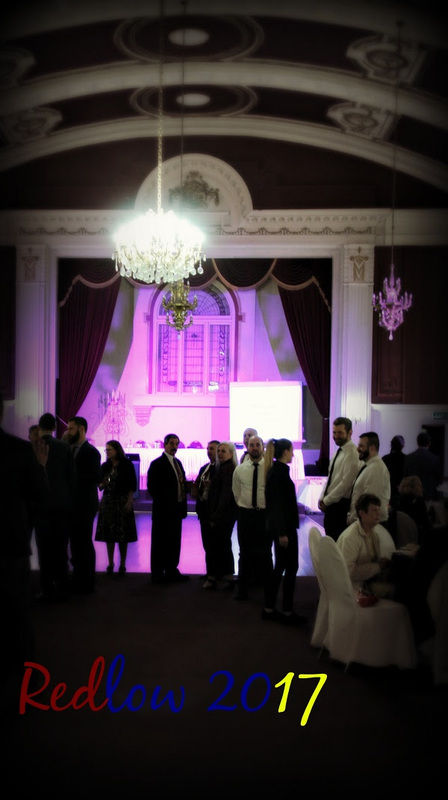 We had close to 190 guests as the largest event Fitzroy has hosted for quite some time. A survey will be out soon to get your thoughts on events and communication from the club. Keep an eye out for that and for all of Phyllis’s pics on the website and Facebook soon. See you next season. Tonight will be a big night for our major sponsors at the Royal Derby as they celebrate five years under the management of Fitzroy and Lions fan Kane Tancredi and his business partner James Duncan. 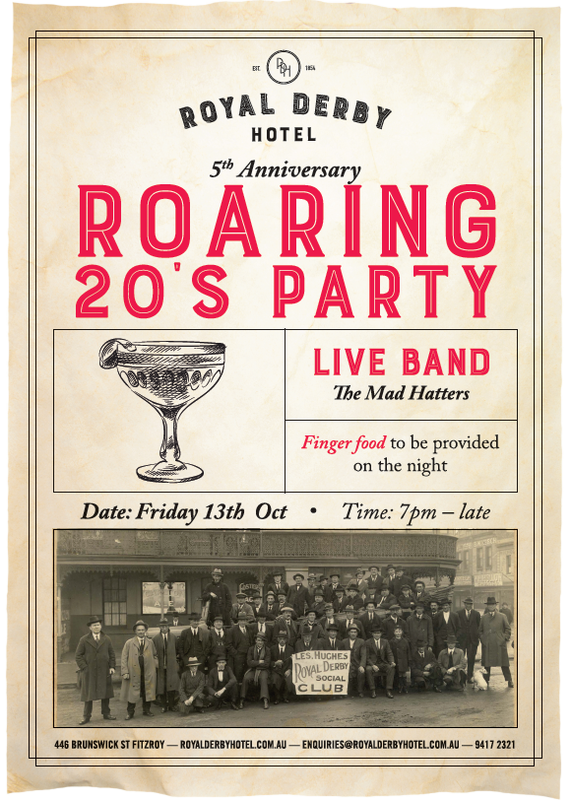 A Roaring 20s Party, featuring band The Mad Hatters, will be in action tonight from 7pm til late. Get on down and join in the fun.